Karen Lord’s Redemption in Indigo – review and giveaway! 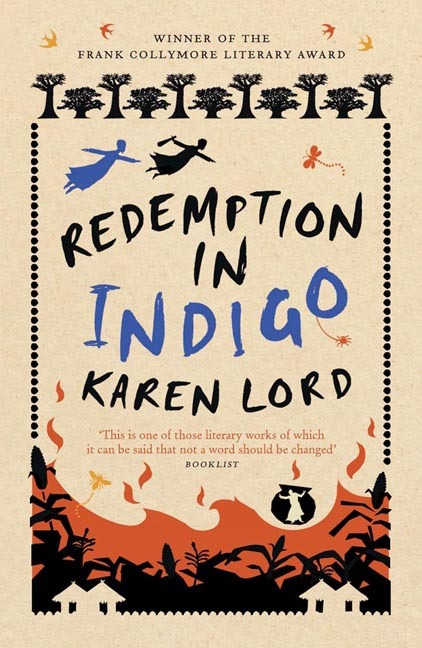 Karen Lord’s Redemption in Indigo is currently nominated for the Kitschies Golden Tentacle Award and, in association with the award, we’re delighted to offer here a review of the novel by Charles Human, as well as an exclusive giveaway courtesy of Quercus Books. ETA: The giveaway is now closed, congratulations to the winners! We have two copies each of both Redemption in Indigo and of Lord’s new novel, The Best of All Possible Worlds to give away. Simply comment below (making sure to include your e-mail address in the required field – this will not show when you post) and we will choose two people at random to receive them. Competition closes Friday! I’m an appreciator of food in literature, being one of those strange few who are always very interested in the menus of the various inns and taverns visited in fantasy literature. Redemption in Indigo features several stews, soups and honeycakes that sound delicious enough to make it difficult not to turn this into a Michelin review. Good thing too because it’s our heroine’s superpower. Yes, Paama kills it as a chef and her husband, Ansige, can’t get enough of the fine dining experience that being her husband entails. Tragically eating is all he’s good for and Paama is eventually forced to leave the useless glutton and go back to her family. That’s when a senior djombi, the powerful race of supernatural undying ones, become interested in Paama and gifts her with the Chaos Stick, a magical item with the power to nudge chance and tweak fate. The Indigo Lord, also a djombi but not the human-liking kind, is a little peeved hat a nasty little homo sapien got given the best djombi tech and sets out on a mission to recover it from Paama. That’s when it all kicks off with human vs. djombi in a battle of wits for the ultimate prize. Redemption in Indigo is a really fun book. It skips around like the story is not predetermined but happens according to the whim of the storyteller. It’s the experience of listening to a storyteller rather than reading that is captured so well by Lord in this book. The narrator is really the central character in the book, his sly asides, in-jokes and preempting of audience concerns is one of the real joys, and one gets the feeling that if he were to tell the story again his choices could be different. That’s also a good thing because choice is central to the story. The Indigo Lord’s choices, Paama’s choices, Ansige’s choices. Whether djombi or human they’re all subject to the forces of chaos and chance but also to those of predestination and perhaps even destiny. Sure, it’s not the not the orphan-born- under- a- special- star kinda destiny but the our-choices-shape-who-we-are kinda destiny that Lord is most concerned with, but it serves make the story very real and human. My only criticisms are that having a narrator means that sometimes that action does lag and that changeable nature of the djombi means that, although they are interesting, the villains never seem truly evil and thus the stakes are not quite high enough for there to be real tension. Also there’s no recipe for honeycakes. It’s an enjoyable read, both progressive and intelligent, and well worth putting on your TBR pile. World SF Blog win Kitschies Award! Two more for the wishlist. Ah, a perfect opportunity to get into Karen Lords highly acclaimed novels. I’ve heard so much about both titles, the covers look magnificent. I’ve been reading reviews and have these on my wishlist. It would be great to win a copy. Thanks for the giveaway; the books look wonderful. Should have had Redemption in Indigo already! Thanks again for expanding the availability of world literature. Would enjoy these titles immensely! Oooo, sounds like a great prize. I definitely want to read both these books. Ooh, I own one of these already as an ebook but don’t have the other! I’ve heard really good things about both of her books and I really want to read them! This sounds like a good read! I really like it when a narrator engages with the reader in fun ways – it doesn’t always work but when it does it adds a great element to the story. Thank you for the chance to win this! This sounds very unique; Karen Lord’s novels have been on my wishlist for a while. Thanks for the review and giveaway! The Kitschies shortlist continues to be a dependable signpost to quality writing. These books look great. I hope it wins a tentacle. I’ve heard so much about both of these books – I’d love for the chance to read them! I’d like the chance to win this too! I find so many books here that I can’t find IRL. Brick and mortar bookstores! Why don’t you stock what I want?